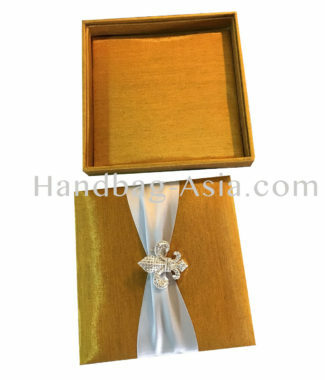 Choose us as your manufacturer of luxury handmade silk wedding invitation boxes. Our factory in Thailand is full of talented workers trained to manufacture high end stationary and wedding invitation. 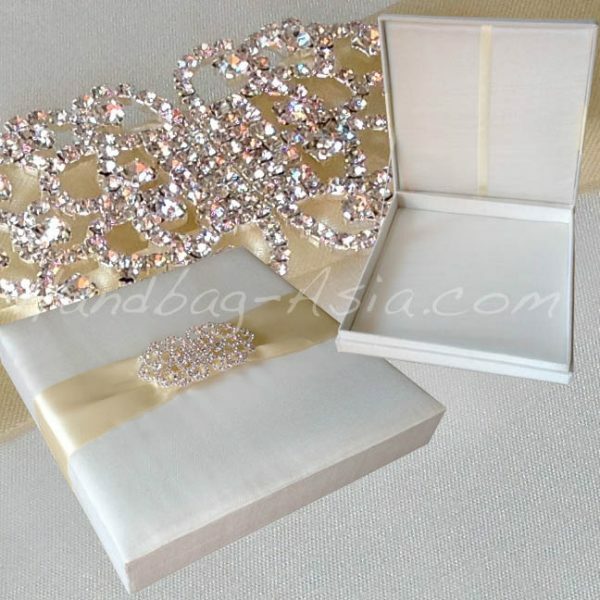 Embellished silk wedding invitation box featuring silver plated rhinestone brooch. This style was kept in ivory theme with slightly darker two inches satin ribbon. The box was covered fully inside and outside with Thai silk. Ribbon holder behind the lid holds your card, on the padded bottom inside the box additional cards can be placed. We can custom make all our invitation boxes in your size and color as well as add another rhinestone brooch if requested.